If you are looking for a unique animal game then Grab a Pig will be perfect. The Grab a Pig card game has been tested by children and parents; as a result it is a multi award winning game. Grab a Pig has been awarded Highly Recommended by the industries prestigious Good Toy Guide consumer magazine on more than one occasion; in 2009 they also awarded it Silver. Children love the bright coloured cute animals all whom have their unique personalities; “My fav animals are pigs, and I love the pigs inside Grab a Pig” one young lady aged 9 told us. 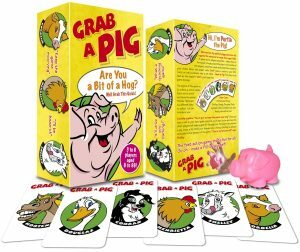 The Grab a Pig animal card game features Conrad the Collie, Shelley the Sheep, Hortensia the Horse, Henrietta the Hen, Douglas the Duck and Cordelia the Cow. Portia the Pig is the main character, she features on the back of every card. Portia is also the character that the plastic pigs have been made from. Grab a Pig is a great choice for a family game or an animal game to give as a gift. It is small enough to take on holiday with you and such good fun. You will get Grab a Pig out whenever you want to play a game with your children or friends. Grab a Pig is a fun animal game that is enjoyed by families and friends all around the world. We hope that many years from now it will still be the game of choice for family gatherings. If you want a portable and riotously funny game then Grab a Pig is a good choice. It is great as a stocking filler, birthday gift or a gift to yourself for when you want a games night.